"We are in desperate hour! I know not what grievous cause has provoked these accursed races to arise, but Orcs, Dragons, Demons and the Dead make haste toward Monarch City. The King and the entire Realm are in need of valiant Heroes!" In the ancient Citadel of Monarch City, the King calls to arms the finest Heroes to defend against a Darkness that engulfs the land. You and your allies must embark on a journey to defend the countryside, repair the tainted lands, and defeat the four creature factions before any of them enter the Citadel. And they approach from all sides! Fast populating Orcs! Fierce Dragons! Undead that bring Fear! An d D emons! All tainting the land in their wake. There are several paths to defeat, but only one path to victory, and only the most valiant Hero will be named King's Champion. 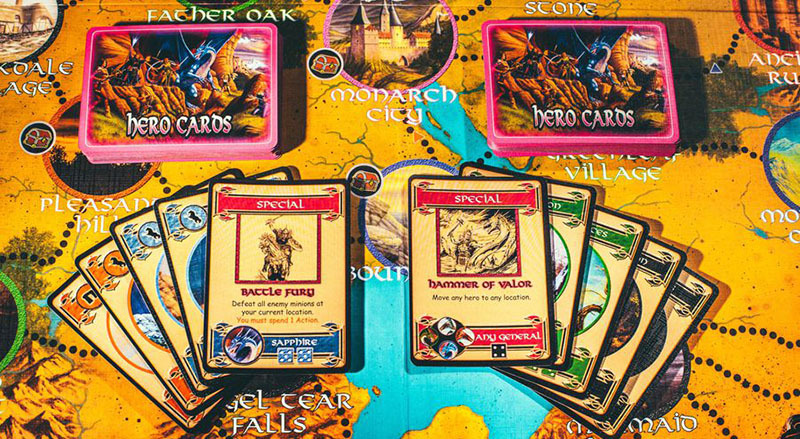 Defenders of the Realm is a cooperative fantasy board game in which 1-4 players take a role as one of the Realm's heroes (Choose from Cleric, Dwarf, Eagle Rider, Paladin, Ranger, Rog ue, Sorcerer and Wizard). You, as one of the heroes answering the King's call, make use of strategy, special abilities, cooperation, card play and a little luck in Defenders of the Realm for a unique experience every adventure. But be forewarned! There is never time to rest. As each Enemy General is struck down in battle, the remaining dark forces only grow more difficult to vanquish and their march to Monarch City gets faster with each Hero victory! In the ancient Citadel of Monarch City, the King calls to arms the finest Heroes to defend against a Darkness that engulfs the land. You and your allies must embark on a journey to defend the countryside, repair the tainted lands, and defeat the four creature factions before any of them enter the City. And they approach from all sides! Fast populating Orcs! Fierce Dragons! Undead that bring Fear! And Demons! All tainting the land in their wake. There are several paths to defeat, but only one path to victory, and only the most valiant Hero will be named King's Champion. 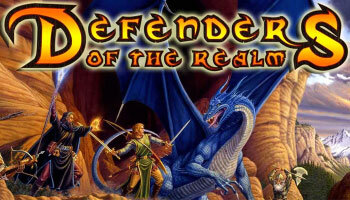 Defenders of the Realm is a cooperative fantasy board game in which 1-4 players take a role as one of the King's Champions (Choose from Cleric, Dwarf, Eagle Rider, Paladin, Ranger, Rogue, Sorcerer and Wizard). You, as one of the King's Heroes make use of strategy, special abilities, cooperation, card play and a little luck in Defenders of the Realm for a unique experience every adventure. Players win by defeating all 4 Generals. If a Darkness Spreads Card identifies minions to be placed on the board and you do not have enough minions to meet the requirements of the card. The last of the 12 Tainted Crystals is added to the board. If 5 enemy minions are in Monarch City at any time. The majority of the cards show 2 locations and either 1 or 2 minions that will be placed there. Additionally there are some special Darkness Spreads cards that should be noted - Orc Activity, All is Quiet, and the Monarch City Card. If the players are losing too often they can make one or more of the rule changes to make the game easier. It is suggested that you do not add multiple changes unless you continue to lose after making one change. During setup, instead of drawing 3 & 3 Darkness Spreads Cards (for a total of 6) only draw 2 & 2 Darkness Spreads cards (so instead of 30 minions on the board to start the game, there will be 24).